Support programme: all pilots working for European airlines will have access to a support programme that will assist and support pilots in recognising, coping with, and overcoming problems which might negatively affect their ability to safely exercise the privileges of their licence. Alcohol testing: As an additional safety barrier, alcohol testing of pilots and cabin crew for all European and foreign airlines who fly into the territories of the European Union, has been added. Alcohol testing is already a well-established practice in some Member States and with this Regulation alcohol testing will now be extended to all EU Member States within the next two years. Psychological assessment: European airlines will perform a psychological assessment of their pilots before the start of employment. "These new European rules take up the proposals EASA made in its swift follow-up of the Germanwings Flight 9525 accident, in consultation with the wider aviation community. With these rules Europe introduces the right tools to safeguard the mental fitness of air crew. During the two year transition period, EASA will actively support European and international stakeholders in implementing this new Regulation". As part of a total system approach, the new rules (so-called Air OPS Implementing Rules) complement the proposals EASA issued in August 2016, on the update of medical requirements for pilots (Part-MED). Effective October 3, 2018, Etihad Airways will introduce the Boeing 787-9 Dreamliner on its scheduled services from Abu Dhabi to Rabat, capital of the Kingdom of Morocco, replacing the Airbus A330-300 currently serving the route. The introduction of the technologically advanced aircraft on Rabat services is a further boost to its presence in the Moroccan market. On May 1 this year, the airline placed the 787 Dreamliner on its daily flights to the kingdom’s commercial hub, Casablanca. The move to place the aircraft on Rabat flights will provide customers travelling on Etihad Airways’ Moroccan routes with full product consistency, the latest inflight technology, and increased cargo capacity to further boost trade. Delta Air Lines and its partner Aeromexico will connect the city of Detroit with Queretaro starting Sept. 17, 2018, creating a bridge between these two major industrial cities. This is the 13th route launched under the Joint Cooperation Agreement between both airlines, strengthening the power of the network in the transborder market. The route will be operated on Embraer 190 aircraft with 99 passenger seats, 11 in Clase Premier. The Boeing Company has reported second-quarter revenue of US$24.3 billion reflecting higher commercial deliveries and mix, defense volume and services growth. GAAP earnings per share increased to US$3.73 and core earnings per share (non-GAAP) increased to US$3.33 reflecting solid execution across the company. Results also reflect a charge related to the previously announced Spirit litigation outcome ($0.21 per share). Boeing delivered strong operating cash flow of US$4.7 billion, repurchased US$3.0 billion of shares, and paid US$1.0 billion of dividends. The company's revenue guidance increased US$1 billion to between US$97.0 and US$99.0 billion, driven by defense volume and services growth. Commercial Airplanes margin guidance is increased to greater than 11.5% on strong performance and Defense, Space & Security margin guidance was adjusted to reflect the impact of cost growth on the KC-46 Tanker program. Boeing Commercial Airplanes second-quarter revenue was US$14.5 billion reflecting higher deliveries and mix. Second-quarter operating margin increased to 11.4%, reflecting strong operating performance on production programs, including a higher 787 margin, partially offset by a charge of US$307 million related to cost growth on the KC-46 Tanker program. This cost growth was primarily due to higher estimated costs of incorporating changes into six flight test and two early build aircraft as well as additional costs as it progress through late stage testing and the certification process. Boeing continues to make steady progress towards final certification for KC-46 Tanker and recently completed all flight tests required to deliver the first aircraft, which is expected to be in October this year as now agreed upon with the U.S. Air Force. Commercial Airplanes booked 239 net orders during the quarter, including 91 widebodies. Backlog remains robust with nearly 5,900 airplanes valued at US$416 billion. 328 Support Services GmbH (328 SSG), the type certificate holder of the Dornier 328, has signed a Letter of Intent with AMC Aviation, the North Carolina, US-based aircraft sales and leasing company to develop a multi-role/ multi-mission humanitarian version of the D328 turboprop. Working with its partners, Jetran International and Jetcor Aviation Services, the group has committed to an initial three aircraft in the conversion programme. 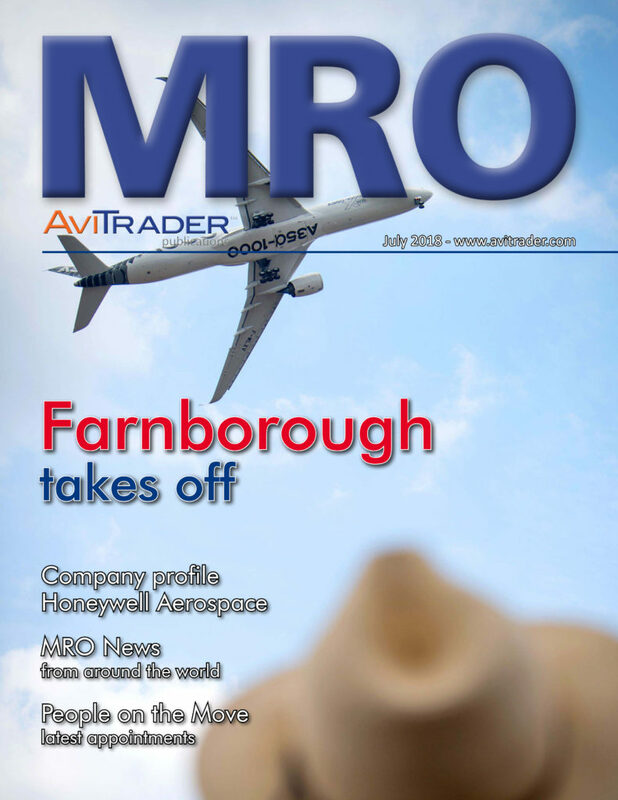 The deal was ratified at last week’s Farnborough International Airshow between 328 SSG’s CEO Dave Jackson and Chris Stern, General Manager of AMC Aviation. The first two D328s are ex Corning aircraft and are planned to enter modification and maintenance this August at 328’s Oberpfaffenhofen Airport, near Munich base, to be ready for delivery in early 2019. A third aircraft, with the same modifications and additional systems plus Air Operable AFT cargo door and oversized windows on either side of the aircraft, will follow. The initial programme of work on the first two 328s will cover - C1 through to C4 maintenance checks; upgrades to the existing avionic systems; modifications such as ADS-B out, Dual Flight Management (FMS), plus SATCOM with Wi-Fi and satellite tracking capabilities. The installation of gravel kit for better unapproved runway operations and provisioning for systems including retractable turret for EO/IR camera installations and other systems will further enhance the aircraft’s operational advantages. The 328s will be delivered with 12 different interior options in Passenger/Passenger-Cargo (Combi)/ Medevac/Casevac versions. In each the toilet and galley system will be relocated to the forward portion of the aircraft for AFT loading and Air Dropping of cargo. 328 SSG is currently engaged on a “Re-Entry into Service” inspection programme, taking the aircraft to the latest standards for maintenance. This certifies the Type Certificate holder has inspected and repaired the aircraft to near production level standards so they can operate into jurisdictions that have strict aircraft age limitations. A group of 15 air traffic control students from the kingdom of Bahrain have completed their ICAO 051 training with Airways New Zealand, the globally renowned air navigation service provider. The agreement with the Bahrain Ministry of Transportation and Telecommunications’ Civil Aviation Affairs (MTT), SERCO IAL and Tamkeen to provide ICAO 051 air traffic control training within the region is a first for Airways New Zealand, which provides air traffic control training services to customers around the globe. The Middle East is a key market for Airways – the ANSP has been delivering ATC training solutions and consultancy services in this region for more than 20 years. Two instructors from Airways Training travelled to Bahrain in mid-May to commence training with the 15 students over a period of seven weeks. The students complemented their face-to-face training with the ICAO 051 Airbooks training package – a digital learning resource which helped to bring the course content to life for the students through the use of interactive animations, graphics and video content. Aviation consultancy IBA has appointed Peter Walter as Director - Asset Management. Walter joins IBA from Bellinger Asset Management where he was Head of Origination and Client Relations EMEA. He will oversee IBA’s asset management growth plan as it seeks to expand its breadth of expertise and broaden its range of services in line with emerging global opportunities. Prior to Bellinger, Walter worked as Fleet Planning Director for Flybe and also spent over 10 years in aviation finance roles at Santander and Alliance & Leicester. In his previous roles Walter acquired many years’ experience across aviation transactions and asset management strategies looking at new aircraft with top tier airlines, higher yield asset risks, remarketing, leasing and mid-life to part-out transactions with a total value of over US$3.5 billion. 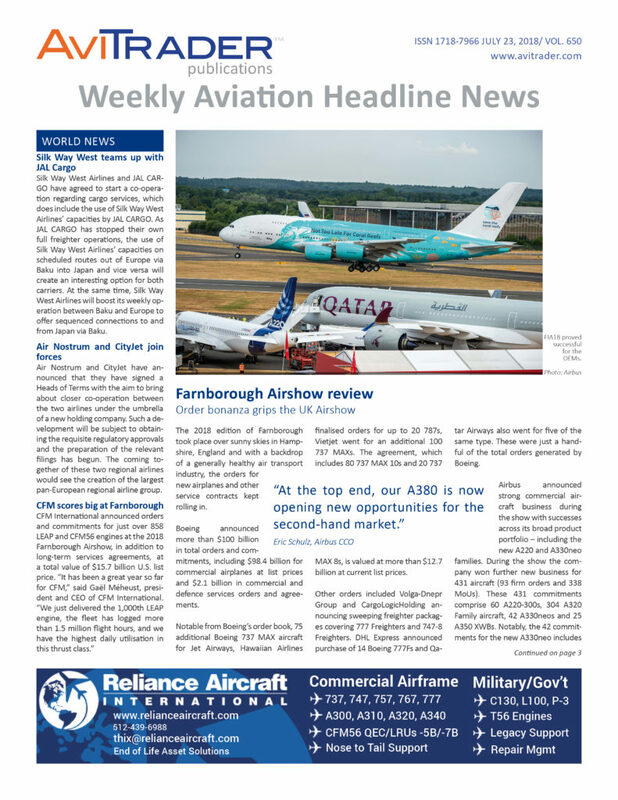 Piedmont Airlines, a wholly owned subsidiary of the American Airlines Group, will open a new maintenance operation at Albany International Airport (ALB) to service its growing fleet of Embraer 145 aircraft. Piedmont expects to begin hiring for the base in August bringing more than 50 jobs to the area. The new facility will provide maintenance support for Piedmont’s northern routes, including international routes out of Philadelphia. Piedmont will hire airframe and power plant mechanics, quality control inspectors, aircraft parts clerks and avionics technicians for the new base. Independent MRO provider Monarch Aircraft Engineering (MAEL), is to open a new Component Maintenance Centre in Northampton in September 2018. The new Centre, in which MAEL has invested approximately £2 million, is being located in Northampton as that is mid-way between its Luton and Birmingham base maintenance facilities and on the motorway network within four hours’ drive of all of its UK line maintenance stations. 20 people will work at the new Component Maintenance Centre, with 10 new jobs being created. The Centre will be led by Lee Burgess, MAEL’s Head of Maintenance. Since becoming an independent MRO provider in October 2017, MAEL has announced a wide range of new agreements with airlines which, in addition to Thomas Cook, include Virgin Atlantic Airways, China Airlines, Wizz Air, Icelandair and La Compagnie.